When I left academia after the completion of my PhD in 2010, I wasn’t sure where I was headed. I did know, however, that my dissertation—Bleeding Chrome: Technology and the Vulnerable Body in Feminist Post-Cyberpunk [available for download in my "about me" box above]—was not the end of my research into the ways that technology and the body intersect in science fiction. I was proud of my thesis, but there were avenues of inquiry that I wish I had been able to follow. One of those underdeveloped approaches was reading science fiction with a disability studies framework in mind. I was acutely aware of how little published (academic) work there was on reading disability and the disabled body in science fiction. Given the vast number of characters with disabilities (plus all of the plot devices of idealized “cures,” transformative surgical interventions, genetic therapies, and fantastic prostheses) in the genre, I was having a hard time watching and reading anything science fiction(al) without critically interrogating the representations of disability I saw playing out time and again. Unable to let go of my academic interests, I decided to transform myself into an independent scholar and jump into the world of academic publishing. My edited collection, Disability in Science Fiction: Representations of Technology as Cure, was a germ of an idea that finally took root during Renovation (the 2011 WorldCon). After receiving overwhelming positive support for the project from new friends and like-minded people, I returned home from the con and sent out a “call for papers” the very same week. By the end of the winter, I had 13 contributors preparing innovative and interdisciplinary readings of disability (with a focus on prostheses and the posthuman) in science fiction. At this point in time, I should note, I had zero publications to my name. Dealing with chronic ill health and limited resources throughout my graduate career meant that I had no time or energy to pursue publishing opportunities while I was in academia. I wasn’t sure that anyone would want to publish an essay collection by a first time editor with no publishing track record. Nevertheless, I was determined to find the best press possible for Disability in Science Fiction because I believed in the value of the interdisciplinary critical analysis that it was presenting. After weighing distribution capability, promotional assistance, price point, and speed of the peer review process, Palgrave Macmillan was one of the first few publishing houses I approached. I sent my book proposal to them old-school style: I followed the directions for submissions listed on their website and, forking out the extra money for tracking and express post, mailed in my pitch. I was worried that some intern would simply shred my package on arrival, but my proposal was successful! Three weeks later the publishing house contacted me and told me they were interested in the collection (contract to be offered once the full draft was complete). All in all, in took two years from conception to publishing the edited collection. The process of editing an academic essay collection is not a speedy one, but I think that my position as an independent scholar helped me move through the process faster than it otherwise might have gone. I selected essays that were on popular films and novels—such as George Lucas’ Star Wars, James Cameron’s Avatar, Daniel Keyes’s Flowers for Algernon, and Elizabeth Moon’s The Speed of Dark— and instructed everyone to write in accessible academic language, so that (non-academic) fans of science fiction interested in the topic would also be able to read and engage with the ideas in addressed in the collection. I kept in frequent contact with the book’s contributors, gave out a lot of direction and praise (the first is easy to come by in academia, the second…not so much), and went through several rounds of drafting. Each person who wrote a chapter for Disability in Science Fiction brought a unique perspective to the questions that I previously had been working through alone. Editing this book gave me the opportunity to collaborate with scholars from across the globe, and it is an experience for which I am grateful. Throughout the two years I worked on this project, I received amazing feedback and advice from both the academic and fan communities of science fiction. It was that support that helped me write and edit through pain flares, injuries from overwork, and fatigue. Editing the essay collection taught me that it is possible to have a voice as an independent scholar and that there is a whole community of people out there who are as passionate about the same stuff as I am. Disability in Science Fiction is one piece of the on-going scholarship that brings together science fiction and disability studies. My hope has always been that the book brings greater critical attention to the all too often negative and damaging stereotypes of people with disabilities perpetuated by science fiction, a genre that, despite its flaws, I and so many others love and take comfort in. 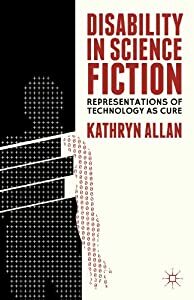 My edited collection, Disability in Science Fiction: Representations of Technology as Cure, is available for sale August 14th (Google for your choice of internet bookseller)! I received my author copies late last week and the book looks beautiful. I love the cover (thanks to Andrew Holden and Tom Pepper)--I think it perfectly reflects the critical analysis going on inside. When I was brainstorming ideas for the cover, I wanted an abstract image of a person being dissected, or broken down into their physical parts. The shearing away of the mid-section stands in for the ways in which the disabled body is often medicalized into its "problem" parts (instead being viewed as a functioning whole). I also wanted to express the impact of technology on the body--the "+" and "Ø" signs represent binary code (1s and 0s). And since there is an emphasis on prostheses in book, the arm in red both marks the simultaneous absence/addition of such technology to the body. The image can be read in a number of interesting ways, relevant to both science fiction and disability. In the design, there is a sense of transcendence from the fleshy body that I didn't anticipate coming through. I like that the figure appears to continue off the left side--no arm is visible there but the person nevertheless feels complete. Overall, I think the cover nails the focus of the content of the collection. I hope that people enjoy Disability in Science Fiction and decide to take up their own responses to the ways in which disability and people with disabilities are represented in science fiction (and fantasy, horror, romance, mystery, and all the other understudied genres). There is a lot of critical ground to cover, images to unpack, and new stories to be written. Disability in SF is only one piece of a larger, on-going conversation and I'm excited to be part of it! We are delighted to announce the FSN2013 symposium, taking place at the University of East Anglia, Norwich, on Saturday 30th November 2013. The keynote speaker will be Professor Matt Hills, author of Fan Cultures (Routledge, 2002) and Triumph of a Time Lord: Regenerating Doctor Who in the 21st Century (I.B. Tauris, 2010). We also invite expressions of interest (100-200 words) from anyone wishing to host a short session of ‘speed geeking.' This would involve each speaker chairing a short discussion on a relevant topic of their choosing, and then receiving extensive feedback, making it ideal for presenting in-progress or undeveloped ideas. The day will conclude with a series of working group discussions, which we anticipate will lead to individual and/or collaborative publication opportunities. Please send any enquires/abstracts to: fsnconference[at]gmail[dot]com by FRIDAY 23rd AUGUST. Notifications of acceptance will be sent out w/c 2nd September. You can find out more information on the symposium website: http://www.uea.ac.uk/politics-international-media/events/fan-studies-network-symposium or talk about the event using #FSN2013.